Read the manual, this is maybe the best way to become confused with a camera. However, if you want to become one of the big boys, you need to be brave. 1. "Do not play with the buttons." 2. Only play with the buttons when you absolutely know what and why playing with them buttons. 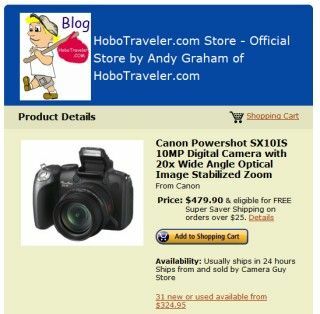 I purchased a Canon Powershot SX10 with a 20X optical zoom on December 2, 2008. This is one of the best Camera I have used, and about my 11th digital camera. I believe it is a little better than the Sony because it powers up, focuses and shoots faster. I buy about one camera per year, however this one may last me two years, if not three. I have owned Fuji and Olympus and truly was not happy, so do not send me recommendations. Finding a PDF manual is an act of God; I carried around the manual for a year, and then left it in the USA on my last stopover. Well, what do you know, the minute I am not carrying the manual, is the minute I need the manual. The focus has become a problem, I talked with Boy Genius, I was asking. 1. Can I defrag the camera chip on my computer? 2. Can I format this 8 Meg chip on the computer? He tells me, this is Image Stabilizing Mode. "How would I know that?" … Hmm, I need the manual. 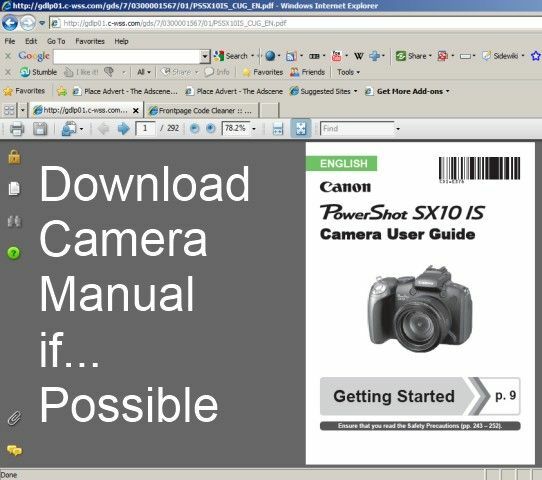 I think my really best advice would tell you to download the manual before you buy the camera. A digital camera slowly becomes junk, the camera needs reset, the software reset, many things I do not understand and do not care to learn need optimized. Therefore, to keep this camera functioning properly I need to read the manual, and un-adjust, what I adjusted, or to be a great photographer, I need to learn more… aagh, this resembles work. I would love to take a camera class, taught by a teacher that uses the Canon Powershot SX10 with a 20X Optical Zoom, and could explain all the menu options. Wiki has something to say, but in the end, this is a game where we teach ourselves the rules. I purchased my Canon Camera at Best Buys, I got the extended warranty, I believe they told me I could drop it and they would replace. Dropping cameras is a real problem, and seemed reasonable, so I tried it, and I hope I do not need the warranty. I normally do not buy the extended warranty, but I thought I could use this one for two years, and the cost would come to 150-200 USD per year. The most important feature I need in a camera is speed, the camera needs to boot up fast, and focus, whereby that girl in bikini rolling in the sand is a possible shot. Girls can walk fast, I spy the target, my mind registers, I pull the camera, and I take the shot. I am not just sitting around trying to take photos, I am reading my book, but I am aware. If you cannot download the manual prior to purchasing, maybe you need to find your local expert to help. When I am in Africa, lying in bed, inside a square concrete room, I need this manual, and when I really need it, Boy Genius is not on Skype, the internet is not to be found. Trust me, this is when you wish you had downloaded the PDF Manual prior to leaving, I recommend you learn from my mistakes, and take a different path. I use the Canon for both still photos and videos, although for sure I can improve the quality of videos. I need to read the manual. Why? I was going to go up to the Pro Version of Canon: Two Problem. 1. Size, the camera is too big to hide, and when you open obviously you are closer to pro, this causes problem with the subjects of the photos. 2. Not all of them will make videos, I think one 5000 Dollar model does. A Professional photographer will have two or three cameras whereby they do not need to change lenses. I do not know of many pros who also make videos, they seem to stay on photos. I think maybe Kevin Site had a good configuration, with Yahoo.com. I am hoping to buy the a pro version of Canon or Nikon, then also have something Pro for Videos. However, to make enough money to pay for the camera is almost not feasible, very few people buy cameras and make money. They normally say they do, but in reality, the camera cost more than they have ever made selling photos. If you want to know if they are really pro to get advice? 2. The will tell you where they sell the photos, and how much they get for a photo. Most of this comes out as gibberish, because they normally lie. I have made 1300 USD selling 13 photos to a guidebook. I also make money on the blog, but I would say I earn about .80 Cents USA per photo and for the videos the same.